We are among the reputed organizations, highly engaged in providing an optimum quality range of Continuous Casting Machines. Our offered machines are widely acknowledged among our clients for their excellent performance and zero maintenance features. The provided machines are precisely manufactured using the qualitative grade raw material, components and modern technology. These machines are available in different models and can be availed by our clients at most competitive prices. The "ETNA" series bring together the range of continuous casting furnaces with capacity of the crucible from 10 up to 140 kg. The user is helped in his work from a graphical interface and display. Access to the machine body is secured by a tubular frame and movable panel for easy maintenance. The drive system for profile is made aluminum body is completely cooled and driven by a stepper motor coupled to a planetary gear, it should be integrated with the casting chamber. All this system is closed by a cover easy to remove: the access to equipment melting (Ceramic jacket, chain bushings, thermocouples) is very fast minimizing the time for replacement. The cooling glass, in harmony with the equipment has been refined so that it can offer the best possible performance. 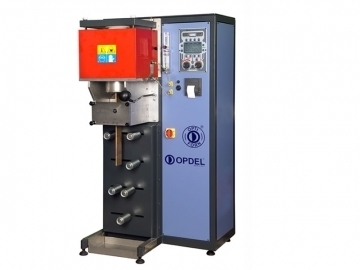 The heart of the machine consists of a mid-frequency system completely designed and built by the Technical Opdel. These furnaces are often used for special profiles where the amount of metal to be melted is high. It can use accessories such as shears or saws for the cutting profile, trays for cooling the same. In some cases it's supplied in combination a tilting melting furnace to maintain the continuous casting of the profile without having to stop the draw. Incorporated in 1985, we “Delmer Opdel Technology Pvt. Ltd.” take immense pride in introducing ourselves as the established manufacturer and supplier of quality assured Centrifugal Tumblers, Static Furnace, Continuous Casting Machines, Furnaces For Heat Treatment, Vacuum Casting Machines, etc. These products are manufactured using modern technology and high quality raw material in compliance with the set international quality norms. Acknowledged for their features like trouble free performance, zero maintenance, low power consumption, long service life, easy to operate and high efficiency, these products are highly demanded in the market. Our clients can avail the offered range from us in several specifications as per their demands. Our transparent dealings, customer centric approach and ethical business policies have helped us to achieve the strong position in the industry. In addition to this, we provide Maintenance Service of these products.